I don’t have a skating dog, but how about a rooster? 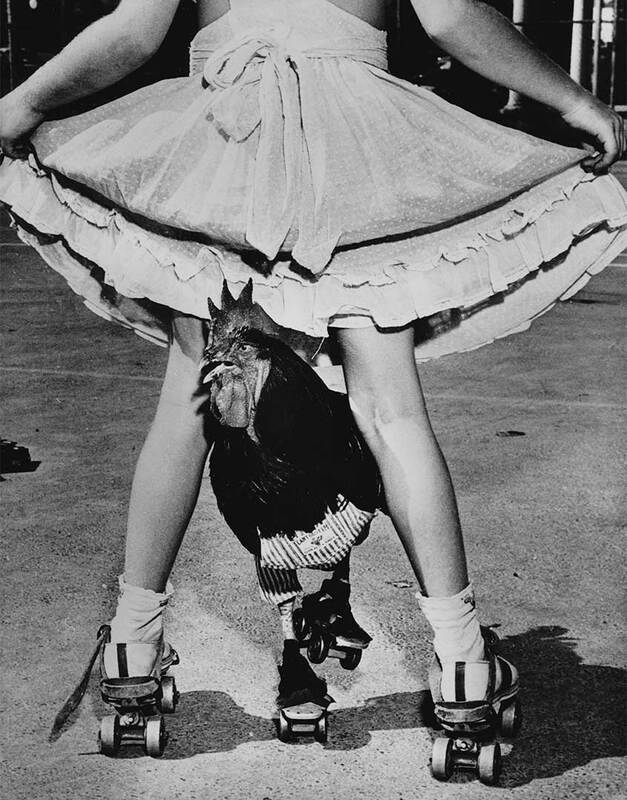 Los Angeles Times, Aug. 17, 1952: Buster, a roller skating rooster, navigates between a girl’s legs during a photo session with former Los Angeles Times staff photographer Leigh Wiener. Because of an incident that happened to me when I was a photographer for the Los Angeles Times, I now have a surefire method of dealing with strangers who approach me on the street and ask me to take their picture. A reporter and I were sent to a run-down part of town on South Alvarado Street to cover an apparent hit-and-run auto accident. Arriving on scene, we discovered that what had happened wasn’t much of a news story. There were no deaths, no injuries, and no damage to speak of. As we were about to get back into our car and leave, a man who fit the stereotypical “wino” image stepped out of the small crowd and came over to me. In a voice that was soft and cultured, he said, “Mister, will you take my picture? I’m Billy Lehr.” I was about to tell him to get lost when I suddenly remembered a phone conversation I had had three weeks before with a New York picture agent. The agent told me that he had heard there was a dog in California that could roller skate. If I could find that dog and photograph him, I could make a lot of money. “That can skate?” I asked. Why else indeed, I thought. The following day — my day off — I made arrangements to meet the gentleman and his bird at two in the afternoon. What a meeting! Billy and Buster — Buster being the rooster — were on time. Billy was dressed as he was the day before with a few more stains on his shirt. Buster, however, wore a clean pair of “You Can’t Bust ‘Em” overalls, and his custom-made roller skates simply shined. Some youngsters joined our party, and soon I had exposed 10 rolls of film with my Rolleiflex. The Times ran the pictures big, and by the time Associated Press and the United Press International had finished with them, the pictures of a skating rooster had appeared in almost every paper in the world. The story of Buster didn’t stop there. Two months later Lehr contacted Wiener and asked him to meet him at an ice rink. There was Buster with his new ice skates. His proud owner was clean-shaven and wore brand new clothes. The only sad note on this occasion was that the young girls skating with Buster couldn’t keep up with him. He outskated them all. Again, the Times gave a lot of space to the pictures and one of the editors, Hayden Reese, provided the photo essay with an appropriate headline: BUSTER THE ROOSTER CAN SKATE BETTER THAN HE USTER!